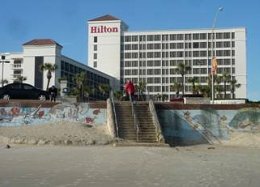 Hilton Galveston is a reliable best value hotel for tourists who prefer reasonable hotels in Galveston. The hotel is a ten story 150 bedroom resort built in 1985 and renovated some years later. It is located on the seawall among other hotels. Hilton is just a step away from the seawall bridge. It's one of the closest hotels to the beach. It is well equipped with fitness and recreational facilities and other modern amenities. The hotel is very receptive to holiday visitors. A friendly staff is on hand at anytime. Gulf view is very prominent from the hotel but the rates also vary. Hilton has all kinds of special offers. Do find out about the monthly (weekend) sale and advance purchase rates. It's the right size hotel with nice a hallway for fast moving tourists. The proximity to site attractions is perfect. It is in the center of all attraction sites including the Strand shopping center in downtown. There is a recommended local shuttle to some tourist locations and the Galveston cruise port. Visitors might want to Inquire about that. The outdoor swimming pool is one of the busiest site in summer. A nice small restaurant called the Palm court serves breakfast, lunch and dinner at the hotel. 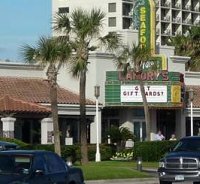 Hilton Galveston hotel is surrounded by numerous restaurants likethe Rainforest restaurant, I-Hop and the Landrys seafood restaurant. Hilton is in the throng of holiday activities. The rate is reasonable with no parking fee except for valet parking. A quick note: Pets up to 30lbs. are allowed at the hotel for a non-refundable fee. So bring your dog to the beach. It is basically a great place along the seawall to start a vacation. Click here to see more pictures of the hotel.